A time I both anticipate gladly and somewhat dread. The weather is decidedly warmer, with even the cold fronts having lost their icy edge, and today my seeds arrived. I am an advocate of later seedstarting. The soils which stay cold, and seeds rotting within, indoor tomatoes struggling in leggy, sappy growth, none of these are my idea of having a jump on the season. That, and the fact that spring means a whole cartload of work for me… I, in good Northern fashion, warm slowly to the seasons demands. This week I’ll go ahead and plant my seeds for indoor starts, once into it I will chew off some of the chores that are standing in a long queue for me this year. My brain is at work trying to figure out how to bribe encourage the kids to lend me their youthful strength for some digging, raking, and …dare I hope? pruning. I always enjoy gardening once I start, but confessing to you that as this body ages, it is sometimes a worry how I will weather the demands of the hard physical work. Most of it is the transition that it takes for me to mentally embrace a different sort of garden. And a more reasoned approach to parsing out the work in smaller, more frequent spurts of activity, rather than the marathon endurance test of how far the human body can go. But once the feel of dirt between my fingers, the smell of sweet earth and benediction of the sunshine upon my shoulders…. then I am once again in the thrall of my garden. Good luck with the seed sowing. You really need to get the greenhouse up! Ilona .. I can’t wait to feel the earth too .. the ground is still frozen and we have the renos to get done .. but that first dig into the garden .. that IS special !! 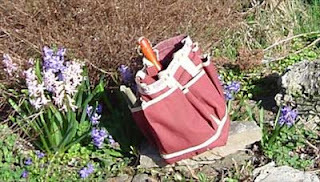 I love your blog handle: GardenJoy4Me… it makes me feel positive every time I see it. It is special, and how nice that it happens annually. It makes me think that our frozen ground is a blessing in that way: we rest with our garden and the anticipation of a new season and it’s burst from the ground renews us, too.